Trevor Smits is congratulated for receiving the Recondo Badge by Maj. Gen. Hughes, commander of U.S. Army Cadet Command and Fort Knox, at the 6th Regiment Advanced Camp graduation on July 10 at Fort Knox, Kentucky. Out of the 110 UNG cadets who completed Advanced Camp, which is required for all commissioning cadets, 77 rated outstanding or excellent this summer at Fort Knox, Kentucky. 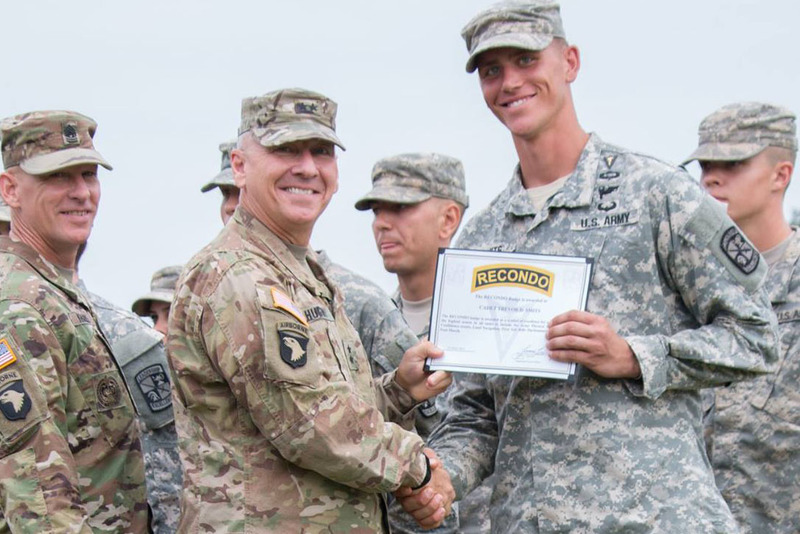 Trevor Smits, a second lieutenant in the U.S. Army who earned his commission from UNG in August, earned a coveted Recondo Badge, which requires a cadet to demonstrate the highest levels of proficiency in marksmanship, land navigation, and light infantry tactics. Close enough to perfect earned Smits a coveted Recondo Badge, which requires a cadet to demonstrate the highest levels of proficiency – 90 percent or higher – in marksmanship, land navigation, and light infantry tactics. "I was very excited to earn the Recondo badge but I could not have done it without the training from the instructors and my peers at UNG," said Smits, who graduated with a criminal justice degree. "The preparation and training set me up for success and was the best training I could have asked for." Out of the 110 UNG cadets who completed Advanced Camp, which is required for all commissioning cadets, 77 rated outstanding or excellent – the two top levels of completion. To earn a score of outstanding – which 30 UNG cadets achieved – means they were in the top five or six of a 30- to 40-person platoon, said MAJ Donovan Duke, an instructor in UNG's Department of Military Science and an active-duty Army officer. "They did a really good job and this evaluation was significant compared to the past three years," Duke said. "We did really well in the past three years as well, breaking school records, but this one was a little tighter and a little tougher. U.S. Army Cadet Command had a better system for evaluating cadets." Smits is just one of three UNG cadets who earned individual recognition; seniors Addyson Albershardt and Hayden Venable both won the Bold Spirit Award, voted on by Advanced Camp instructors. Albershardt also was recognized as the female cadet with the highest score on the Army Physical Fitness Test. 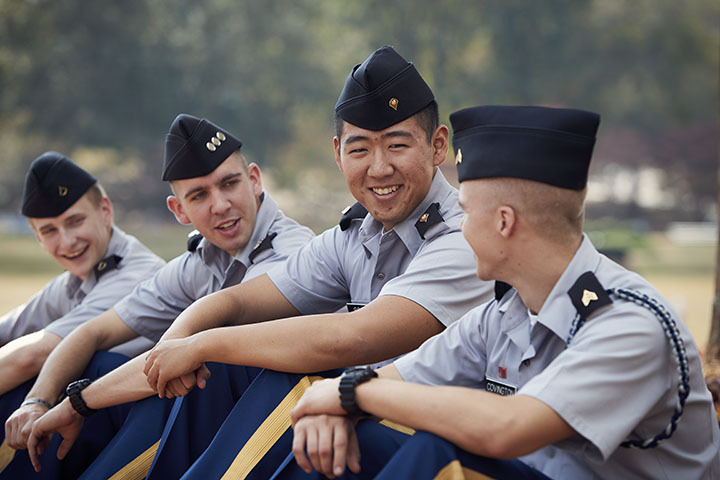 Duke credits the Corps of Cadets' Leader Development Program (LDP) and the cadets themselves with the year-after-year success. "We have battalion staff and observer-trainer-mentors, called OTMs, who are seniors and they are the primary instructors. In my opinion, they are the reason why we do so well," Duke said. "We make some minor changes each year to match the current training, but they go out and execute." Smits agreed the UNG system led to his overall success at Advanced Camp. "Through the constant professional development and teamwork, I was able to transfer what I learned at school into the events and training I did at Advanced Camp," said Smits, who was born at Fort Bragg, North Carolina, of a military family. Having to teach their fellow cadets reinforces what they are learning, and it replicates the training and professional development they will have to provide their soldiers when they lead a platoon as a newly commissioned second lieutenant, Duke said. He also credited the active duty Army instructors at UNG who lead LDP, with keeping the cadets on track with the learning outcomes expected by Professor of Military Science COL Brent Cummings. Up next for Smits is his wedding day on Sept. 23 and he'll receive his branch assignment in November; then, he's off to Basic Officer Leadership Course to begin his military career. 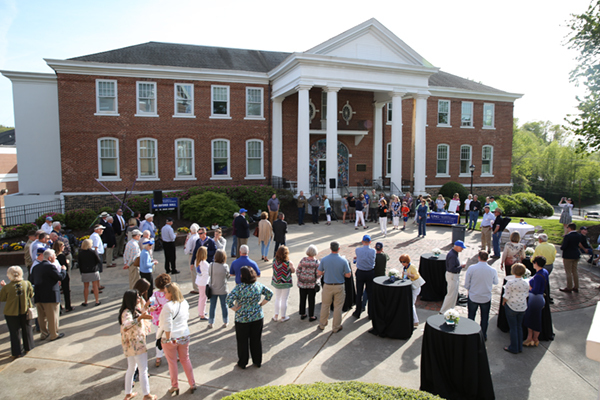 Duke said officers who commission from UNG are well equipped to start their careers off on the right foot from day one. "I would put some of our UNG cadets up against current first and second lieutenants who have been in the Army for a year or two because they are more knowledgeable from the exposure they get," Duke said.